Summer in the garden! Fresh lettuce every day…’Red Sails’, ‘Buttercrunch’, ‘Flashy Trout’s Back’, ‘Red Iceberg’, ‘Speckles’, ‘Slobolt’. I’ve thinned the carrots and eaten the tiny sweet roots. 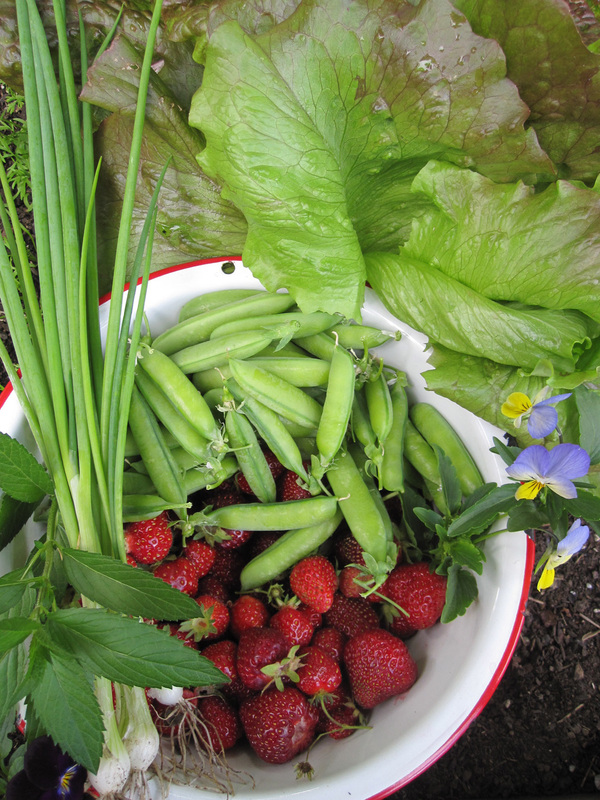 Peas are coming on, strawberries get picked every few days. Bunches of mint are drying on the porch, and when I want fresh basil I walk outside and pick some. Cherries are ripening, but there will be no grapes this year. The vines got frosted hard last winter and were slow to wake up. ‘Silvery Fir Tree’ tomatoes (a Russian heirloom) have small green fruits, and I am pleasantly surprised by the progress of the other tomatoes. Green beans are beginning to vine up their strings, and the cucumber plants are blooming. In the flower department, honeysuckle and syringa fill the garden with scent. Clarkias are in full pink flower. Campanulas, spirea, poppies, roses, larkspur…the lilies have buds. The zinnias are predictably chewed by earwigs, but are growing above the bug zone. They will be fine. The swarm of bees we caught packed up and left, although a handful remain without a queen. I’ve been feeding them honey and will combine them with a hive from Chris and Katie. Bees have a home in this garden. The windows and doors are open, the cats and I go in and out. Big salad and peas for supper tonight, and flowers on the kitchen windowsill. Hard to say where the garden ends and begins. It’s woven in and out of life in July. Nice garden update! Sorry to hear about the bees decamping. Will you try again? I read that windows and doors are open. How about that screen door? Perhaps we will have to get together and re-engineer the hanging. E-mail me!